Roter Bolus für Poliment Gold Verarbeitung. Dieser Bolus wird intern von Sinopia hergestellt und ist das Resultat von Jahrelanger Forschung und Tests. 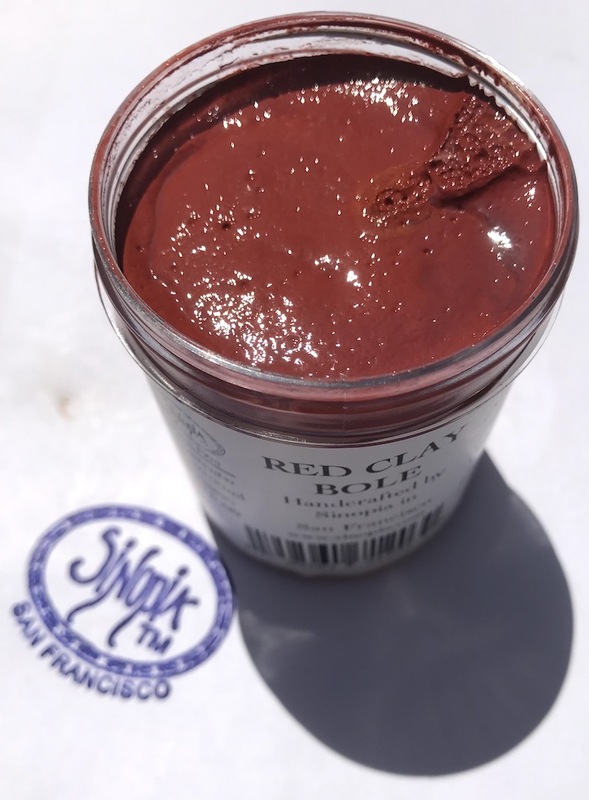 Red Clay Bole for use in water gilding techniques. Red Clay Bole is considered the standard color for applying gold leaf. Gold Leaf is pounded to a one micron thickness and therefore the color beneath the gold reads through leaf. Red Bole warms up yellow gold and creates deep rich red voids between the leaf. Use over traditional chalk gesso ground. Bole needs to be applied with a solution of rabbit skin glue. This Bole is manufactured by Sinopia. The formula was developed by working with master gilders to craft a rich creamy bole that burnishes to a beautiful highly reflective luster. I bought it a few months ago, just to see what that was. After all, there are many bole-makers around, here and oversees. To my great joy, I found Sinopia's bole to my best liking. It is rich and creamy; it has a phenomenal covering power; it is very finely ground and very well mixed. I use it for icon backgrounds, and it takes very little to cover lots of surface. Sinopia's bole handles better than Selhamin, and looks definitely more "alive" than LeFranc. Congrats to Alex on formulating this bole! This bole is also very versatile. If you want it matte, just apply the bole, and after it dries, don't polish it with a cloth, and just gild on top of it. It will retain its slightly grainy surface and will look like the background of a 15-century Byzantine icon, a soft and quiet glow. If you want it somewhat more reflective but not too much, just polish it with some rough fabric but don't burnish. But if you want a mirror-like surface, it burnishes really well. The color is also very beautiful; it harmonizes well with 22 karat. Q: I am seeking Armenian bole. Is your product the same or similar for the use of gold leafing on paper? A: Yes, it is the same thing as Armenian Bole. Just add a natural glue (hide/rabbit). Q: How much hide glue do you add to the red bole? Q: Can this be used for raised gilding, just by mixing it with rabbit skin glue? Does it contain plaster or chalk, or does this formula not require it? Is gold applied in the same way as with traditional gesso? A: This bole works the same as any other bole. Raised gilding is mostly accomplished with the gesso surface beneath the bole layer. The bole can applied over any gesso that is raised and/or carved. The bole can be thickened with the addition of honey, in order to create small raised areas. ????? ??? ?????????. ???? ????? ???????????? ???????? ? ??? ?????????????? -- ????????? ???????????? ???????????? ? ?????? ?????????. ???? ???? ?? ??? ??? ???? ????? ??? ?????? ?????? ???? ?? ??? "?????? ?